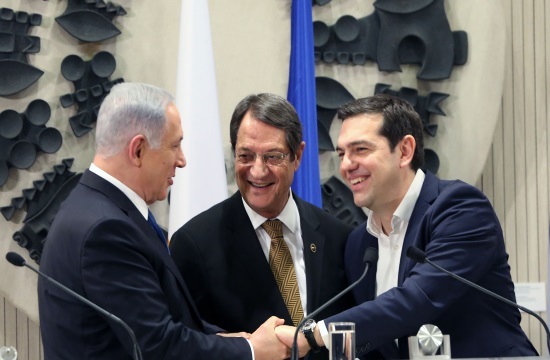 Greek Prime Minister Alexis Tsipras called on Turkey to respect International Law at the Press Conference following the 5th trilateral meeting in Israel with Cypriot President Nicos Anastasiades and Israeli PM Benjamin Netanyahu on Thursday, protothema.gr reports. “We have emphasised the need for respect of international law in the Eastern Mediterranean and the Aegean. Respecting, in particular, the right of Cyprus to exercise its sovereign rights in its EEZ “. Mr Tsipras went on to underline the need for a just and viable solution of the Cypriot problem with the scrapping of the guarantees on the occupied part of the island and the withdrawal of the Turkish occupying forces. The Greek PM and his Israeli counterpart discussed the East-Med energy pipeline, as well as the creation of an innovative technology park in Thessaloniki, which will offer the opportunity for synergies between Israeli start-ups Greek and Balkan enterprises. The future pipeline is reportedly supposed to carry 10 billion cubic meters (bcm) of natural gas to Greece from the Eastern Mediterranean (approximately 1,900 kilometers) where it will then link to Italy’s Poseidon pipeline. The meeting, which took place at the National Cyber Directorate and Carasso Science Park in the southern city of Beersheba, is the fifth of its kind. On the Palestinian issue. the Greek PM said he reiterated Greece’s dedication and support to achieving a viable two-state solution, which would ensure peace and security for both peoples. The Israeli Prime Minister spoke about Beer Sheba, where the Summit was organized, which was transformed from a region in the middle of the desert into a modern city with an important role in high technology and cybersecurity. Meanwhile, Ambassador to Israel David Friedman joined the summit to show US support for the East-Med pipeline project. The “USA fully supports the project that aims to diversify energy sources in the area and ensure energy security in Europe,” Friedman noted.